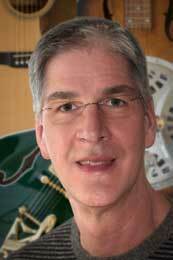 For nearly thirty years I have provided guitar lessons at all levels — from novice to advanced. I help performers who are looking for new ideas. I teach private lessons year ’round. Also, from time to time I offer group classes and workshops. Having recently relocated to North Dakota I offer Fargo guitar lessons in my home studio. Also, students may schedule remote lessons via FaceTime or Skype. Contact me here to ask a question or to reserve a lesson time. Who should take lessons from me? I gladly welcome students interested in almost any style of guitar or ukulele playing. Above all my goal is to support and encourage. Therefore I tailor lessons to the desires of each student. I have studied folk, country, classical, jazz, and blues guitar styles. As a result I am well prepared to point the way. My performances range from churches to bars, and from live radio to concert and festival stages so I am at home in different settings. Using finger style and flat picking techniques I play rhythm accompaniment, lead guitar and chord/melody style. My ukulele lessons focus on rhythmic strumming and finger picking. Using many familiar songs students learn common chord progressions for different musical styles. I teach chord-based styles or melodic playing using either high G or low G tuning. First of all, the basics of guitar or ukulele playing are quite easy. Establishing good practice habits accelerates progress. Thus even people who have never played an instrument before quickly succeed. I encourage students to draw upon any prior musical experience as a foundation. Aspects of playing a piano, violin, clarinet, trumpet or even drumming all have parallels on guitar or ukulele. I recently relocated to Fargo, North Dakota after teaching for decades in Seattle, Washington. Years on staff at Dusty Strings Music Store & School and offering friendly guitar lessons furnish me insight and experience working with many fascinating people. There are many great ways to learn music. Some people are most comfortable learning to “play by ear.” In contrast others succeed by reading musical notation or tablature. Still others become adept at watching experienced players and following their example. As a teacher, I am comfortable with each of these methods. For these reasons I try to find what works best for each student. I encourage everyone to explore each of these methods. Offering folk, country, bluegrass, jazz and classical guitar instruction, I expose my students to all of these styles. I teach finger picking and rhythm guitar at beginning to advanced levels. I love to show beginners that they can have fun playing ukulele in fifteen minutes even if they think that they possess no musical talent. Everyone wins! I teach guitar and ukulele students individually in my home studio in Fargo, North Dakota. Students may schedule remote lessons via FaceTime or Skype. Contact me here to ask a question or to reserve a lesson time.